During the first three years of the Civil War, a series of Union generals led the Army of the Potomac against Confederate General Robert E. Lee with little success. In March 1864, Abraham Lincoln appointed General Ulysses S. Grant commander of all Union armies. Grant came east to personally lead the Union forces in Virginia. Grant’s strategy focused on the destruction of Lee’s army, the Confederate economy, and Southern morale. Between May 5 and June 24, Union and Confederate troops clashed almost daily in relentless, brutal fighting. By June 24, when Grant settled into a siege at Petersburg, Virginia, the two armies had suffered more than 83,000 casualties—dead, missing, and wounded. From August 18 to 21, Grant concentrated his army on the capture of the Weldon Railroad. It was Richmond’s main supply line and the link to Wilmington, North Carolina, the only coastal port still held by the Confederates. While the war lasted another eight months, Grant’s victory at Weldon left Lee’s army and the Confederate capital without supplies. This political cartoon represents the military situation in August 1864. 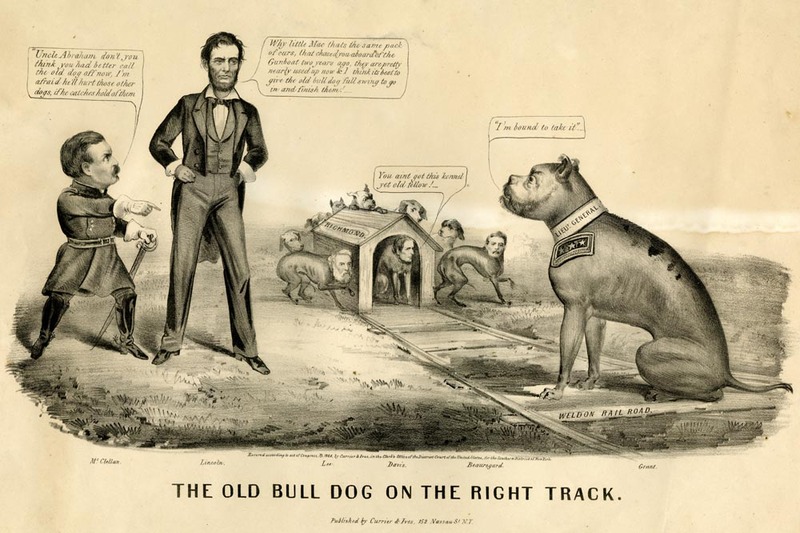 The bulldog Grant has cornered the Confederates Robert E. Lee, Jefferson Davis, and P. G. T. Beauregard in their doghouse (Richmond) while the Union’s Democratic presidential candidate, General George B. McClellan, implores President Lincoln to call off his dog. "THE OLD BULL DOG ON THE RIGHT TRACK." [General George B. McClellan to President Lincoln]: "Uncle Abraham don’t you think you had better call the old dog off now, I’m afraid he’ll hurt those other dogs, if he catches hold of them." [Lincoln to McClellan]: "Why little Mac thats the same pack of curs, that chased you aboard of the Gunboat two years ago, they are pretty nearly used up now & I think its best to give the old bull dog full swing to go in and finish them!" [President Jefferson Davis to General Ulysses S. Grant]: "You aint got this kennel yet old fellow!" [Grant]: "I’m bound to take it"
Read the introduction and the transcript and study the cartoon. Then apply your knowledge of American history to answer the following questions. A) Compare the cartoonist’s depictions of General Grant and General Lee. B) Compare the image of President Lincoln with that of Jefferson Davis. C) Judging by these illustrations, what is the cartoonist’s point of view? This political cartoon was published about three months before the 1864 presidential election. 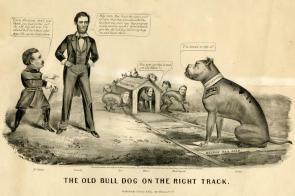 How does the cartoon help us understand the campaign positions of George B. McClellan and Abraham Lincoln? Use the visual clues in the cartoon to explain how the cartoonist expected the Civil War to eventually end.